CNG: Printed Auction CNG 75. BOEOTIA, Thebes. Circa 395-338 BC. AR Stater (12.08 g). Damo-, magistrate. Struck circa 390-382 BC. Sale: CNG 75, Lot: 248. Estimate $300. BOEOTIA, Thebes. Circa 395-338 BC. AR Stater (12.08 g). Damo-, magistrate. 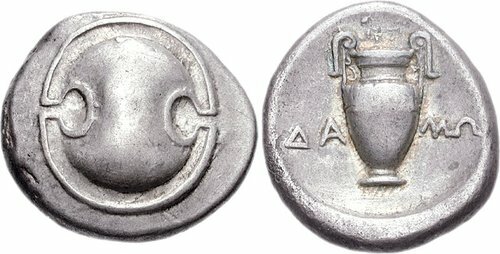 Struck circa 390-382 BC. Boeotian shield / Amphora, three ivy leaves and berry hanging from left handle; wreath above; DA-MW across field; all within incuse concave circle. BCD Boiotia 492. VF, toned. Struck from the same dies as the following lot.